So… the Sales are in full swing: have you got sales fever or are you over it and ready for new-in? The thing with the Summer sales is that they seem to go on for an age, don’t they? Though no doubt, it’s a great time to buy trans-seasonal pieces which can be worn into Autumn and pulled out again next Spring… and right at the tale end of the sales is a perfect time to pick up any last minute holiday buys, though by then, you’re chancing it with sizes. 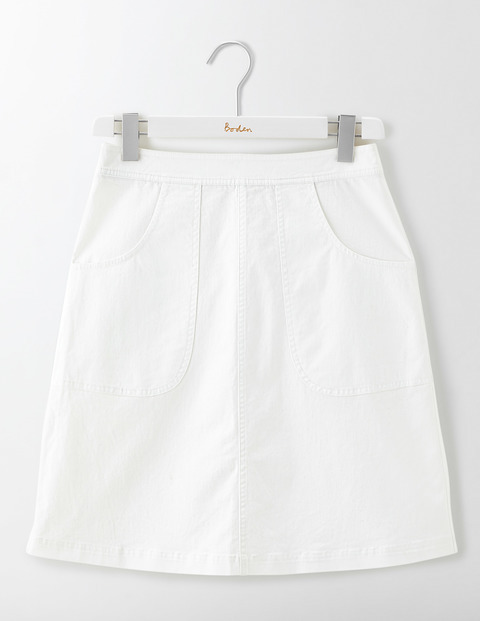 Anyway, enough sales talk…today I thought I’d dedicate an entire Sunday 7 edit to my current obsession: white skirts. A lovely summery skirt at a really good price! If you squint a little whilst looking at it, the skirt *could* have a little of the Self Portraits about it, but a closer look and yeah… not so much! Although this skirt would be longer on us shorties, it means the underskirt would also be a little longer in length which is, in my opinion, all the better. Anyway, the skirt looks great here with the Topshop styling, but it could be a great evening skirt on holiday with a cute summer evening top and heels or wedged espadrilles… and like wise, a perfect little skirt for a mooch around a small french town’s historical streets and market with some flat tan sandals and a singlet/vest top. A similar floaty style of skirt to the first one, but just in plain cotton. With a cute little tie waist detail. This skirt would come up to true midi length on us shorties, but that’s no bad thing? Equally, it’s a straight forward hemming job for if you wanted to take it up. If you look at the other photos on the New Look website, it looks a little see-through and even more sadly, doesn’t look like there are any pockets! However, for just shy of 20 quid… it’s a pretty summer skirt. If you’re not afraid of getting your knees out, this is a really cute option. It’s a classic gentle a-line skirt but the horizontal lace bands across the skirt add a lovely detail. I’d happily wear this with sneakers and think it might look pretty cool with a loose fit tee over the top for a more casual vibe. I love this skirt and have had my eye on it for a while… sadly it hasn’t been added to the sale though. 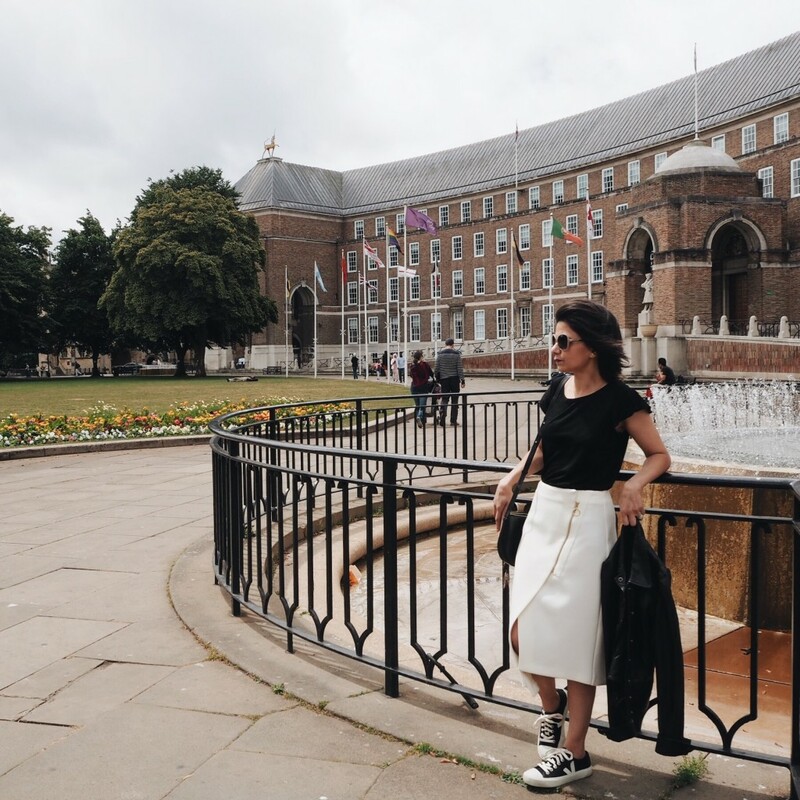 What I love about the skirt is that it’s a versatile style: could be worn to the office, for mooching around at home, for going out, for holiday: it’s a great shape. And again, yes… it would come up longer on us shorties, but again, I don’t see that as a bad thing. The Front slit sorts the longer length issue out for me… and yes, it can be taken up easily. Plus it has an elasticated waist and pockets. White skirt perfection really, don’t you think? You can trust Boden to come up with a classic skirt which is classic shape and of course comes in Petites, Regular and Longer lengths. 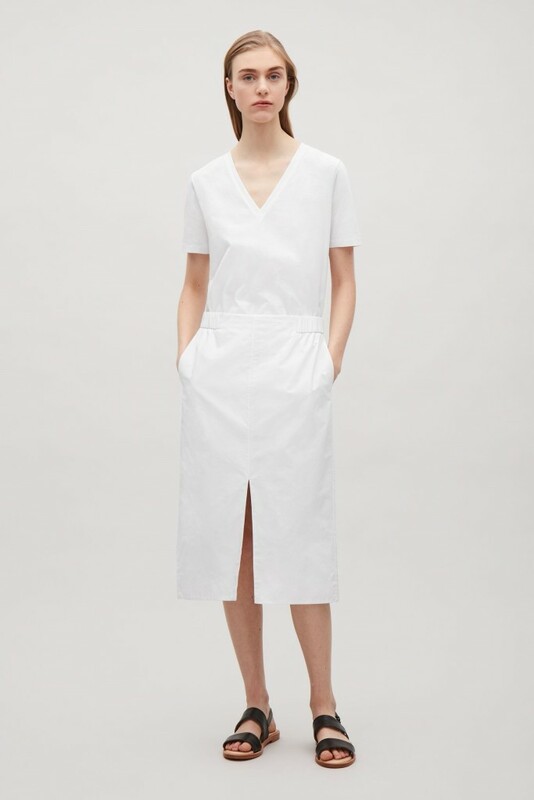 I can see myself wearing this on holiday with flip-flops and a vest top… as well as out in the evening with a cute little gingham blouse and some heeled sandals. Love, love, love this Cos skirt. However… the only reason this isn’t at number one is that I have a feeling this is a regular height or taller ladies skirt… the extra folds of fabric would add far too much bulk to a smaller, shorter frame. Now I’ve featured this skirt before… and after reading the review online about it being ‘too heavy a fabric and shapeless and poor fit’, I must admit, I let that review dictate my opinion on it and walked on past the skirt when I saw it in Topshop Oxford Street a week or so ago. Actually, that’s not true, I did pause to touch the fabric (it’s a thick crepe) and looked at the skirt which was on the mannequin and thought ‘yeah, does look a funny shape, poor design/cut and it is thick fabric more suited to Autumn Winter’… and so didn’t try it on. However, this Popper Midi is also made of a thicker, almost chamois leather style fabric. And as mentioned last week, I had a bit of a niggle about whether to keep it or not… although I couldn’t put my finger on exactly what it was that I wasn’t 100% happy with. In the end, I worked out that yes, the skirt felt ‘too young’ for me in that it’s quite Kardashian/Jenner with its triangular front split, the poppers and built-in-mini skirt, which is fine, if that’s a look you are after. It’s just not very me and so I returned it because I felt I could do better with my £49. And so I ordered Asymmetric Zip Midi skirt in both sizes 6 and 4 from the sale. And quelle surprise (given it’s my number one): I love it. Looking at this close up, you might just be able to see that although the crepe is not see through, having the skirt wrap over itself does make the front a little bulky. However, it looks really nice on and I like the gold zipper more than I thought I would. 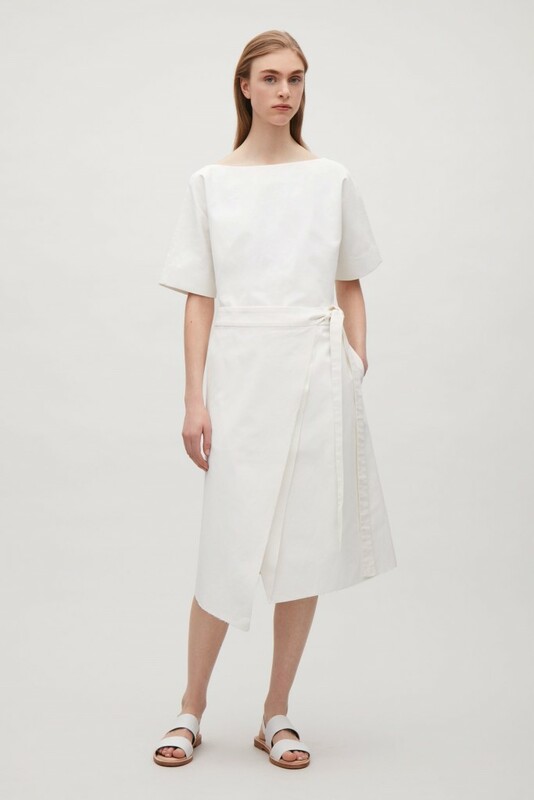 I also like the weightier crepe fabric and do think it’s one which will look great worn in Autumn with a Navy or Black roll neck and ankle boots. It’s probably not as versatile as some of the others in terms of high-summer or holiday wear, but that doesn’t bother me because really, holidays are few and far between … as are true heatwaves in our country. Also, I have to say… it’s not actually white. It’s most definitely cream… but again, I think I prefer that to a brilliant white in cooler weather. Now this isn’t a terrible skirt really, but the Crepe is unlike any crepe I’ve ever felt… in fact, it’s rather felt like it was made from Crimplene – a high polyester content fabric propular in the late sixties and early seventies… the sort of fabric in which you should never, ever get within 50 feet of a naked flame, if you know what I mean. But having tried it on… I can confirm it is totally see-through. So the fabric I might forgive. So not being a ruffly kind of gal, this skirt is outta my comfort zone… but it’s kind of cute. 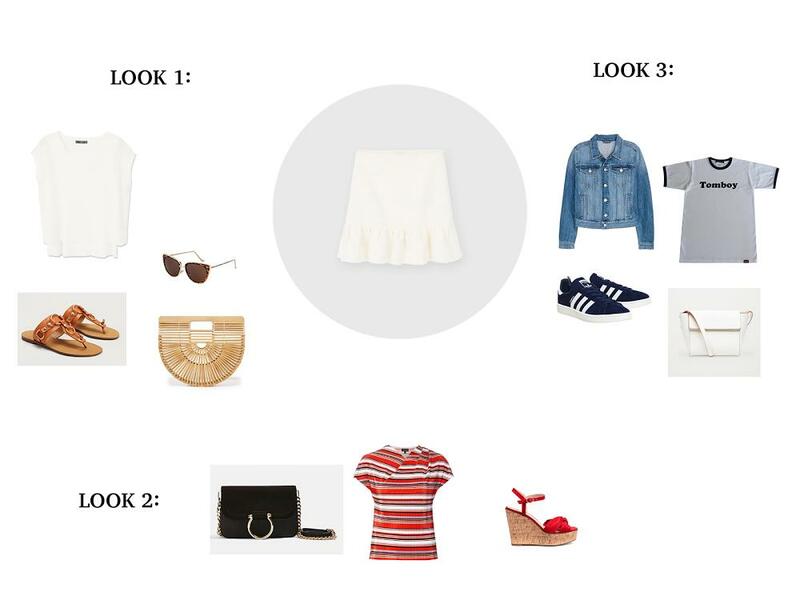 Look 1 – White & Tan: Getting a white top to match / work with a white skirt can be a tricky business! But, as I’ve not seen this skirt in the flesh, I’ve just plucked out a white top I like the look of, which is this Mango Ribbed T-shirt (£12.99). Just add some Tan Sandals (Mango £79.99) and your Cult Gaia Bamboo Bag (£100.63 – pre-order now for mid-July) and your HM Tortoise Shell Sunglasses (£12.99), and you’ve got a great summer outfit. 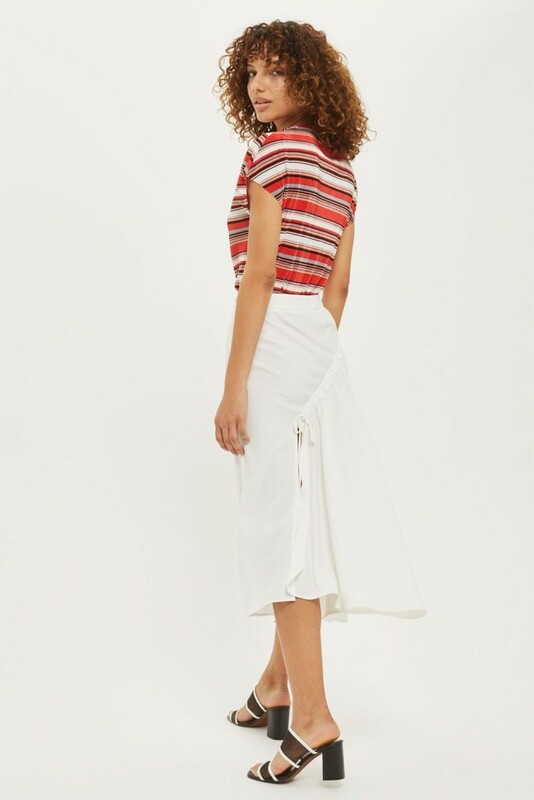 Look 2 – All the Colour: Stealing this idea from the Topshop site (see Stinker of the week above) but yeah… love the idea of a colourful tee with the skirt like this Topshop Stripe Twist Neck T-Shirt (£12.99) and add some HM Red Wedge Sandals (£24.99). This is quite a ‘young’ look, given the ruffle of the skirt as well… but I guess in including it here, I’m showing I might be hankering after my younger days a little. Just add this Topshop Remy D-Ring Bag (£25). Look 3 – Casual Cool: And of course, we couldn’t have the 3 looks without me including a casual sneakered look… How about going for some Adidas Campus Dark Blue (Office £69.99) and this super cute Olive and Frank Tomboy Tee (£29) with an HM Denim Jacket (£29.99) over the top? A cute Cos Small Constructed Bag in white (£59.99) would finish the look off. And so that’s it from me for this week. Would love to hear whether or not you’re a fan of white skirts? Leave a comment… love hearing from you. More on the meet-up next week. Til then, thanks for reading.